• 1090 sqft , 3 bath , 2 bdrm “Concrete” – FOR SALE USD449,000 . FULLY FURNISHED PENTHOUSE – IN THE HEART OF THE VILLAGE. Across Alii Drive from the seawall in the village, with easy access to DOZENS of nearby restaurants and a sweet ocean view, this is a Kona home that will pull at your heart strings. 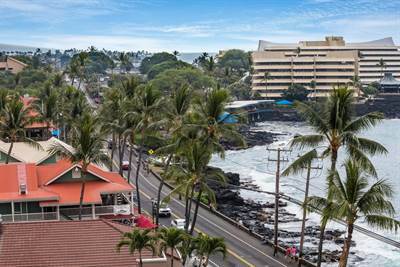 Kona Alii Penthouse 708 in the Heart of Village is TURNKEY and MOVE IN READY! Kitchen has been nicely remodeled and expanded with wood cabinets, stainless sinks and stainless appliances. NEW CARPET is being installed. Comfortable furnishings include 2 flat screen TV’s and 2 King sized beds. Upper level has been converted to a big suite with 1/2 bath, wet bar, huge closet, sitting area and bedroom. A large upper level sundeck is the perfect place to relax and enjoy excellent ocean and mountain views. From the lower level lanai there are smaller ocean views and great city lights. Still more: Two Split System ACs, Storm Shutters on the lanai, Upgraded kitchen with Lazy Susan Corner and Hardwood cabinets, lovely Granite Counter Tops, Full Sized Stack Washer/Dryer, One Assigned Covered Parking Space, Alii Drive Gate is Closed in the evenings, Locked Lobby Doors, Community Pool has solar heat, Outdoor Grilling Area is provided, Hot Water included in condo fee. Sorry, no pets allowed. Vacation rentals welcome. Seller is Hawaii Real Estate Broker. Previous Previous post: How’s the Condo Market – HOT!